Electric heat pump units function best and give the most return in areas with moderate climates. They are most effective where the summer temperatures aren't too extreme and the winter freeze isnt too drastic. These pumps are noted for their high energy efficiency. Compared to conventional central air conditioners they win hands down. Newer models increase savings with innovations like scroll compressors, variable speed motors, and desuperheaters. Changing over from a conventional unit is just one thing that homeowners can do to control energy usage and reduce utility bills. When upgrading to a new unit, dont forget to update the homeowners insurance policy. As the name implies, they pump heat from a cooler area (the interior) to a hotter area (the exterior). In the wintertime they work in the opposite fashion to heat the home. Like air conditioners, they remove humidity from the homes interior air, however theyre more effective. The end result affords two beneficial effects; they use less electricity as well as providing more cooling relief in the dog days of summer when the heat is intolerant. The notable difference between this kind of climate control technology and evaporator/compressor central or window air conditioners is that it circulates heat instead of than producing it. 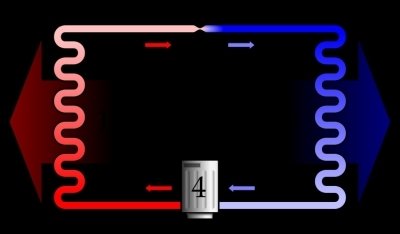 As a result, pumps have the ability conserve as much as 4 times the amount of energy. There are several kinds of units such as the air-source (sometimes called the reverse cycle chiller), the absorption heat pump (the most recent innovation), the ductless mini-split, and finally, the geothermal. In houses that cool and heat with electricity, the air-source model can supply an energy savings of 30 to 40%! Note that as the temperature in degrees falls off in the wintertime, so does the efficiency. Why? Because there is a lower amount of heat in the outside air. This means the pump unit has to work harder to take advantage of the available heat. When should a homeowner consider a heat pump instead of a conventional air conditioner? Primarily, as noted above, a moderate climate rather than an extreme one, is ideal. Next, when the current system is dated and needs replacement anyway. For example, when the SEER rating on the existing unit is low compared to the latest standards, a pump will cause a return on its investment rather quickly. A SEER of 13 - 16 is the common today. Dated models can be as low as 6!. During new construction is another ideal time to install one, especially when going for a green home with LEED certification. It goes hand in hand with installing Energy Star rated appliances. Always check to see whether the unit is eligible for energy tax credits. Two speed compressors: Unlike single speed models, two speed models are designed to deliver only the capacity needed. When it operates in the lower speed mode, considerably less power is used, as might be expected. Compatibility with zone control systems: Two speed compressors are a good match with zone control systems. These maintain different rooms at different temperatures by operating automatic dampers. Dual-speed or variable speed blower motors: This option is designed to circulate air at the optimal velocity, unlike a single speed, which blows at full speed regardless of the conditions. New high efficiency desuperheaters. 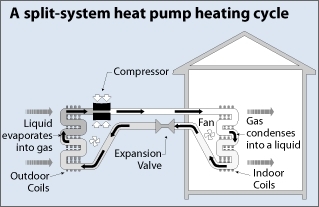 Heat pumps built with an optional desuperheater use waste heat for water heating It does this job 3 to 4 times more efficiently than a tank electric water heater. By adding a tankless water heater as a back-up will save even more energy and disposable income. Scroll compressors. These use 2 spiral shaped scrolls to compress the units refrigerant producing up to 15% more warm air than piston compressors.